If the average office worker were to determine the amount of time they spend in their chair, they would be shocked. Assuming that the individual works for 40 hours each week, this translates to about 1900 hours throughout the year. If you multiply this figure by the number of years, you’ll see that this class of people spends a significant portion of their lives in their office chairs. Now, despite this calculation, most workers spend more money and time choosing a desk than they do when picking an office chair. But this should not be the case. Choosing a low-quality office chair can cause the worker stiff muscles, and in worse scenarios, debilitating pain. It’s important for one to choose a comfortable office chair. Office chairs are available in a huge spectrum of designs and prices. The high-end models- those that cost $1000 and more- are usually more adjustable and durable. But there are still several good options at lower price points. In this article, we focus on the best office chairs under $300. 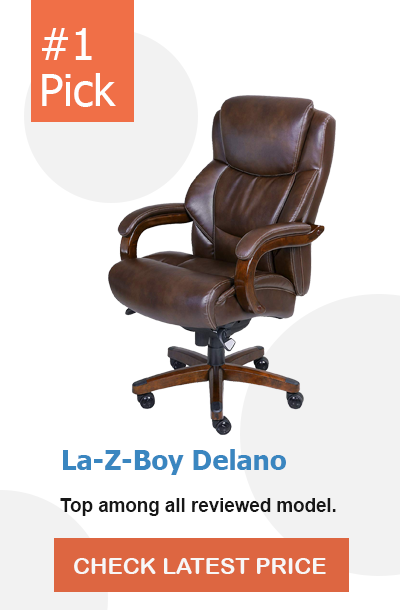 The best office chair on the market is the La-Z Boy DelanoOffice Chair. Although pricy, this office chair has a ton of features that make it stand out. 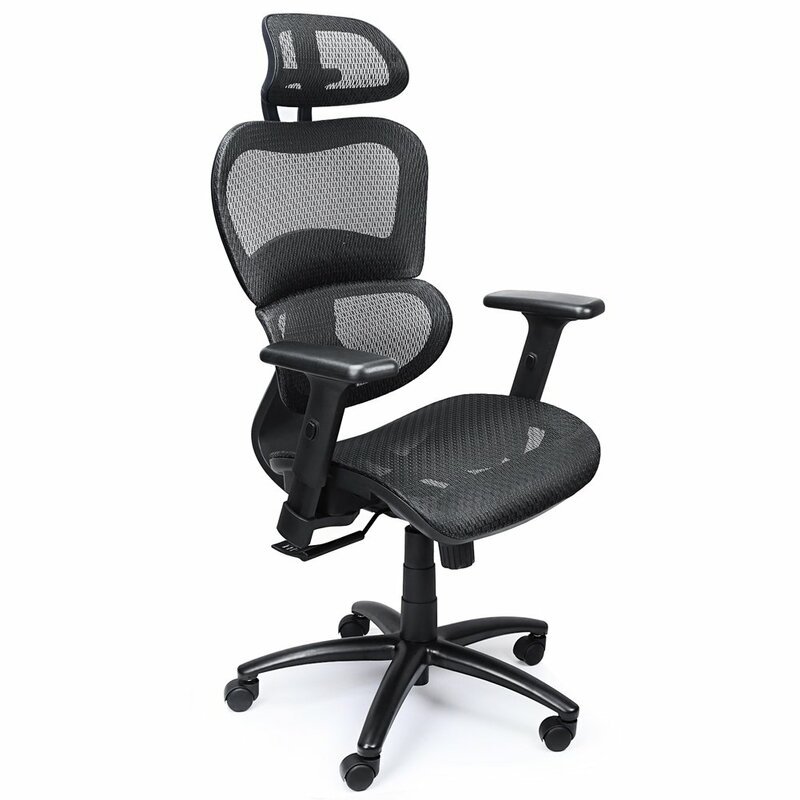 For instance, it’s available in several colors unlike other office chairs that are made in the standard black color. Also, it has a generous weight capacity of 400 lbs. Our second pick is Mysuntown Mesh office chair, and this one gives you excellent value for your money. This one has a mesh construction, which is great for keeping you cool and comfortable. The Merax Inno Series is another top-rated chair worth considering. Not only does it have ergonomic features but it also doubles up as a napping chair. When purchasing an office chair, check whether you’re able to adjust the height to correspond to your own height. Ideally, you should be seated in such a way that your thighs are resting horizontal to the floor. For this capability, the office chair ought to have a pneumatic adjustment that allows you to bring the seat higher up. 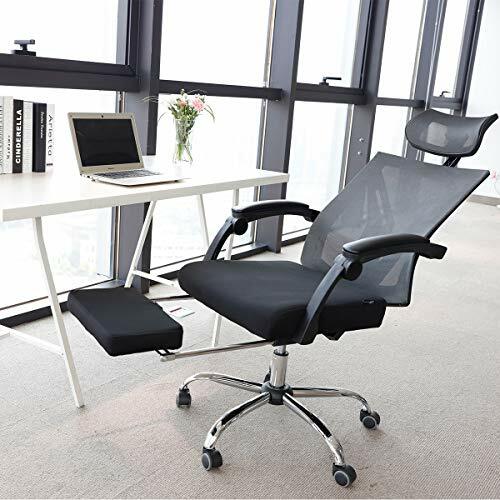 You should be capable of adjusting the backrest in such a way that it suits the specific task you’re working on. Essentially, you should be able to move the backrest in a forward or backward direction. Also, there should be a locking mechanism that holds the backrest in place. If the backrest is detached from the seat, then it should be height adjustable. This way, you can angle it to your preferred position. For optimal comfort and support, an office chair ought to have a contoured backrest. Always go for an office chair customized to mimic the natural contour of your spine. A quality office chair is one that offers sufficient lumbar support. Put simply; the chair should allow you to position your lower back so that it’s slightly arched throughout. By supporting your lower back or lumbar region, you are able to avoid straining the lumbar discs in your spine. Apart from lumbar support, you should also check whether the seat is wide and deep enough. These two aspects are important because they make it possible to sit comfortably for prolonged period of time.If you’re tall, you should look for a deep seat. If you are of average height, then a shallow seat will feel more comfortable. Another thing you’ll want to consider is the material used in making the office chair. Overall, office chairs shouldn't require frequent maintenance. But based on some health care regulations, office chairs ought to be cleaned and sanitized from time to time. If you want a chair that will be easy to clean, then you’re better off choosing vinyl or leather materials. The only drawback to leather is that it tends to trap body heat. A more breathable material is mesh, although it will be harder to clean. Also, mesh office chairs offer less lumbar support compared to leather ones. The La-Z Boy Delano is the most comfortable budget chair for those individuals who can’t match the price tag of other high-end office chairs. One of the features that sets this office chair apart is its design. The manufacturer used a combination of bonded leather upholstery and wood, giving it a sophisticated and expensive feel. This office chair is available in different colors including chestnut brown, taupe, black, brown & gray, black & grey. This way, you will be able to choose a color that matches your office décor. For instance, the taupe-colored option contrasts nicely with dark, mocha colored wood of your other office furniture. Aesthetics aside, this office chair also offers great comfort thanks to the padding and ergonomic elements. The La-Z Delano boasts a layering system made up of ComfortCare Plus and memory foam, providing you with exceptional support. Has a generous seating area. Capable of holding up to 400 lbs. of weight. Allows for adjustment of tilt and height. The leather upholstery is not as breathable as other materials. 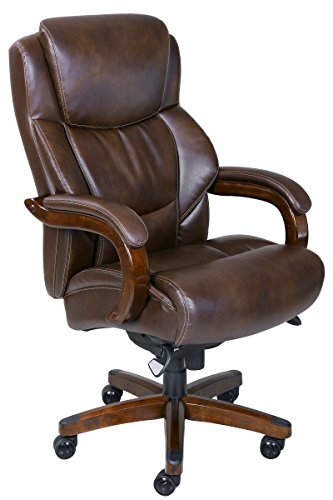 Designed to accommodate 400 lbs., and with a spacious seating area, the Big & Tall office chair is one that is worth investing in. If you want an office chair made of more breathable materials, Mysuntown Mesh office chair is the perfect substitute. Mysuntown is an office chair designed with the user’s lumbar support in mind. It’s an ergonomic chair that provides sufficient support for your lower back while also enhancing the natural curve of your spine. All these features combined ensure that you never strain your back no matter how long you remain seated. Another highlight of this office chair is that it allows for 360-degree swivel. What’s more, it allows for adjustability of the seat height, armrest height and head rest. 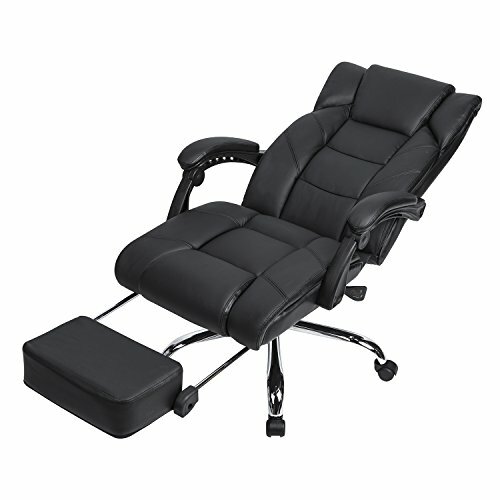 Plus, it comes with a three-tiered back rest, so you can choose the most comfortable position. Made of highly resilient mesh material, Mysuntown office chair is ultra-breathable. Manufacturer offers a 30-day money back guarantee. Constructed from mesh for breathability. Has organic polymer foam padding to provide comfort. Allows for multiple adjustments . For tall users, the head rest might not extend high enough to reach the head. Mysuntown ergonomic swivel chair is a great alternative for users who don’t like leather office furniture. It has numerous adjustment settings and feels very comfortable. Have you been looking for an office chair that doubles up as a napping chair? If you have, there’s no better option that the Merax Inno Series. This office chair is designed specifically for individuals who value comfort. Merax understands that a majority of office chairs have low-quality designs when it comes to ergonomics. As such, it’s equipped with components that provide the best comfort. These include a soft headrest and thick padded armrests. This chair also comes with a padded footrest, enabling you to rest comfortably once you finish your day’s work. The Merax Inno Series also boasts recline locking system. It has a tilting range between 90 and 180 degrees. If you’re one of those people who gets spinal pressure when you sit for too long, this customizable feature provides superb relief. Has an adjustable pivoting lumbar. The footrest is on the narrow side of the spectrum; it’s only 14 inches wide. The Merax Inno Series is perfect for individuals who want an S-shaped ergonomic chair, contoured to the natural curvature of the spine. And the best part is, it can be reclined all the way back to 180 degrees, to give you the perfect napping position. The Hbada is the best ergonomic chair for under $200. But even then, this chair has contoured features and mesh construction, giving it a high-end feel without necessarily driving up its cost. The most distinct feature of this office chair is its mesh design. The use of mesh in office furniture has become a common occurrence. Mesh fabric is preferred because it provides a breathable material which keeps the user cool, especially during the hot months. Also, the Hbada ergonomic chair offers a vast range of height adjustment. More specifically, it has nine levels for height adjustability. Another highlight of this chair is its kinematic tilt mechanism. Users can adjust the recline between 90 and 150 degrees, with an option of locking it into place. It comes with an upgraded seat cushion for comfort. Variety of height adjustment options. Breathable mesh construction making it suitable for use all-year-round. Full recline with an option for adding footrest from a different model. No adjustment for the ergonomic features like the lumbar support. Mesh chairs don’t sit well with everyone. As far as ergonomic office chairs under $200 go, the Hbada is a great buy. Although it lacks a few features, its contoured back and build make it a strong contender for a functional office chair. With a quality ergonomic chair like the Kadirya, you’re less likely to strain and cause injury to your muscles and joints. You can work for as long as you want without getting fatigued. A distinct feature of this office chair is the adjustable backrest. This means that you can switch up the position to accommodate your needs. Plus, this chair has a locking mechanism, allowing you to securely maintain the angle you want. The recline angle ranges between 90 and 165 degrees. As for the armrests, they feature a triangular shape, which makes them comfortable and safe. What’s more, this chair offers superb support for your head, neck and shoulders, and this contributes to a good posture. Thanks to the 5 chrome-plated metal legs, this chair is pretty easy to move around. Plus, the casters feature a 36—degree swivel, making them less likely to damage your floor. Can accommodate 250 pounds of weight. Not the best choice for heavy people..
Kadirya reclining leather is one made of high-quality materials and equipped with an array of features so as to provide uttermost comfort. Have you been looking for an office chair that can accommodate different types of users? More specifically, are your concerned about the maximum weight capacity of your office chair? If you answered ‘yes’ to any of these questions, then you are in luck because the MDL Executive office chair features a load capacity of 500 pounds. Being able to accommodate different users is not the only perk of this office chair. In fact, another thing we like about is that it has thick padding, giving you supreme comfort. Both the headrest and armrests are padded, so you can rest your head and arms comfortably for prolonged lengths of time. Furthermore, MDL Executive chair has been thoughtfully designed with a cable actuated mechanism providing easy control. This chair allows you to tilt it back and forth when you want to rest. Also, the height of the seat can be adjusted to suit your posture needs. As already stated, this is a durable and heavy duty office chair with 500lbs. weight capacity. Factor in the larger seat, and you get the best office chair for big and tall users. Has an advanced cable actuated mechanism. Has a durable and heavy duty design. Has a generous weight capacity. 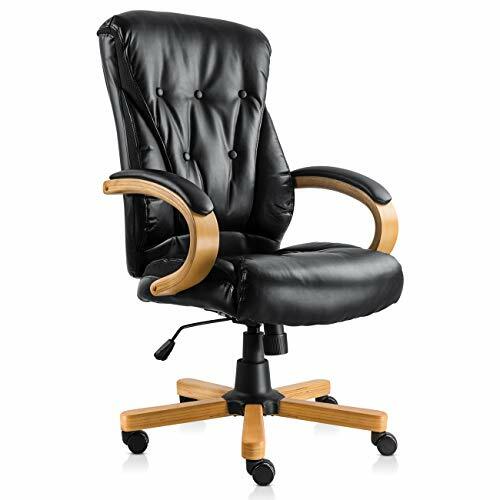 If you’re buying an office chair that will be used by big and tall users, then you need one that has a high weight capacity like MDL Executive office chair. This is another offering from Kadirya but unlike the former choice, this one is cheaper and looks more elegant. This particular model is the best office chair for lower back pain because it’s equipped with numerous comfort and support features. 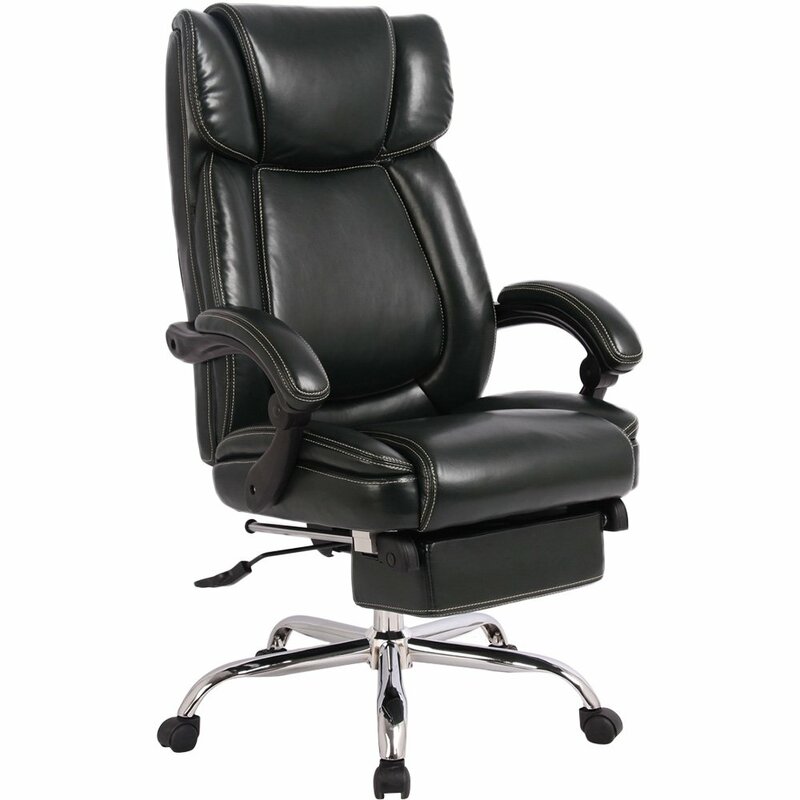 The Kadirya high back office chair boasts a double-layered bonded leather construction. You will actually be able to feel the high quality of this leather around the head, cervical and lumbar areas when you’re sitting on it. 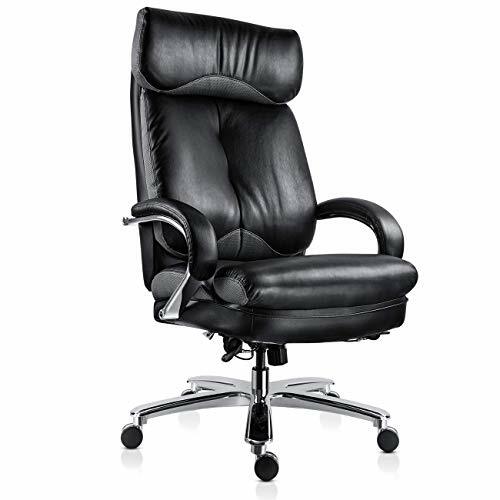 To provide supreme comfort, this office chair has a curved and thick padded arm-rests and a double-layer padded seat. The back also features a double layer, providing you excellent support for your upper body and shoulders. Kadirya High Back office chair is fully adjustable. Essentially, you can control the height, tilt and lift to get that customized position that suits you. It also has a rock-back tilt mechanism, allowing to tilt between a range of 90 and 110 degrees This office chair has a weight capacity of 250 pounds. Padded curved armrest-contoured to the shape of your arms. Comes with a 1-year warranty against defects. Equipped with 360-degree swivel rolling casters. The bonded leather is resistant to stains and spills. Not a good choice for heavy and tall users. The Kadirya High Back is one of the most comfortable office chairs on the market. With a double layer seat cushion, a double-layer back, you’re not likely to find a chair that is more comfortable than this one. The NKV office chair is designed for those who want to add an aura of luxury and professionalism to their offices. The most striking feature of NKV High Back chair is its design. The manufacturer has used black color for the seat and back and a bit of brown on the armrests and wheels. This makes the office chair look classy. It’s made of bonded leather and a matching mesh fabric, making it look all the more expensive. This office chair is also pretty comfortable. Whether you’re working from your office or home, this chair will give you all the comfort you need. As for the base, the manufacturer used a blend of steel and solid wood. These add up to a heavy duty design that can hold up any weight; it has a maximum capacity of 300 lbs. What’s more, all the heights are adjustable and can be locked into position. NKV High Back is an office chair that’s easy to assemble. All the tools and screws you’ll need for this task are included in the package. Bonded leather construction for durability. Polyurethane casters that are wear-resistant. Height can be adjusted between 18.5 and 22 inches. Office chair can be rotated 360 degrees. Does not have a long warranty. If you’re looking to upgrade your office décor, the NKV High Back office chair will make an excellent addition. The Ficmax Ergonomic High-Back is not your typical office chair. It has a massage function, a feature that you’re not likely to find in other office chairs. 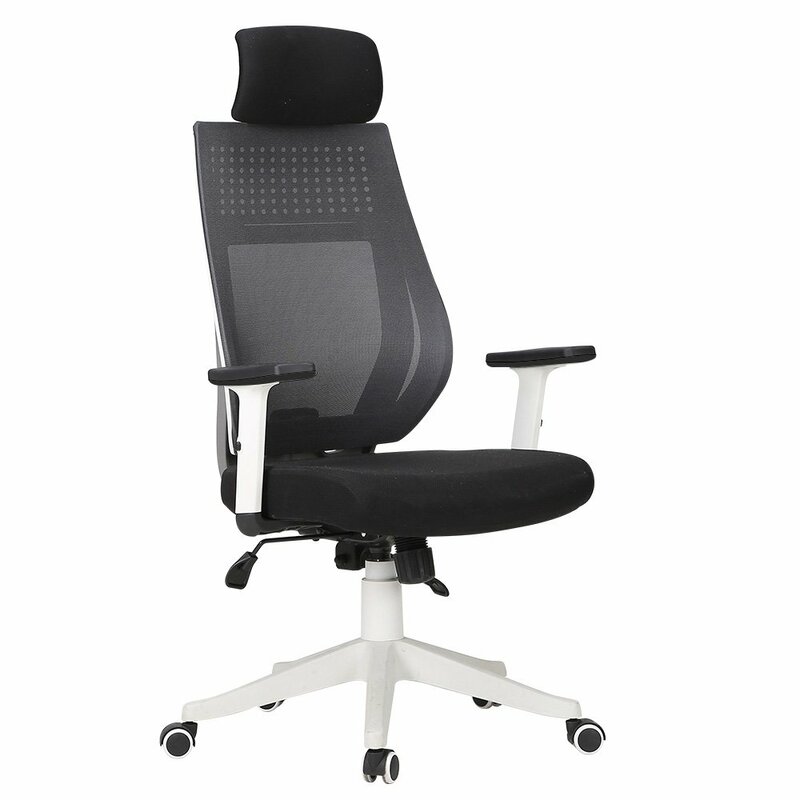 The Ficmax ergonomic is an incredibly comfortable office chair. It is for this reason that the chair was designed for different groups of people. Whether you’re a designer, an illustrator, a gamer or just anyone who sits behind a desk, this office chair will serve you well. The best thing about this chair is that it has a massage function. So after a long day’s work, this massage feature will come in handy; just plug the chair via USB, sit back and enjoy the reward. And even without accounting for the massage, this office chair still gets a five star rating on comfort. Some of the features that make this possible include the retractable footrest and headrest. Plus, the chair can recline all the way back- up to 180 degrees. The only drawback is that it’s made of PVC leather, which can be a bit squeaky. Even though the chair is available in a range of colors, it’s best to stick with black, especially if you plan to invite clients over. Manufacturer offers lifetime warranty of frame. Heavy duty chair base equipped with castors for stability. Wide and thick armrests for added comfort. The PVC leather construction makes the chair to squeak at times. It’s not designed for everyone. As suggested in its name, this office chair consists of an ergonomic recliner. With the Synchro tilt mechanism, one can recline the backrest; thus, increasing the angel between the torso and thighs. This way, the user gets the most comfortable seating position. And the good thing is that the height, tilt and lift are all adjustable. There’s also a tilt lock function to keep the set position in place. Just like the previous Hbada office chair we reviewed, this one is also made of mesh- a material that offers maximum breathability. This keeps you feeling cool and comfortable all day long. This chair also features a waterfall seat cushion, which can be reclined slightly downward so as to reduce the strain on your legs. Other features that add to the comfort are the built-in lumbar support and rotatable headrest. Consists of a steel frame construction, making it durable. Equipped with tilt lock and height adjustment levers. Supports up to 330 lbs. of weight. High density foam and breathable mesh seat. Not the most durable office chairs. Hbada has employed the most environmental-friendly materials to make an ergonomic chair that you can afford. We set out to find the best office chair under $300. To come up with this review, we first spent weeks testing different office chairs on the market. During our analysis, we paid more attention to the actual seat or seat cushion, checking the material it was made as well as measuring its base. We also tested these office chairs based on their ability to accommodate sitters of different heights, shapes and sizes. We found that while some chairs were suitable for tall users, others weren’t. After narrowing down our options to a dozen office chairs, we stress tested each of them. This particular test helped to determine just how well the office chairs could hold up after prolonged use. Some of the chairs, when brand new, did not make a sound. But after a few weeks of use, started creaking. This is an unwelcome feature as it can be very distracting when you’re trying to focus on your work. None of our choices exuded this problem. Also, the office chairs we choose for this review, each have a distinct feature or features that make them stand out from the pack. Seat height- when adjusting the height of the chair, ensure that your feet are horizontal to the floor and that your thighs are level. This goes a long way to prevent you from feeling fatigued. Width- the width of the chair should also feel comfortable. Essentially, a good office chair shouldn’t make you feel squashed or like a dwarf. Lumbar support- by adjusting both the height and depth of the office chair, you’re able to position in such a way that it supports your lower back. Backrest- lastly, the angle of the backrest needs to be adjustable so that it can accommodate your posture. As soon as the clock ticks over, you should try and move around. Just find a reason- any reason- to move from your desk. You can walk to the furthest restroom, go to your colleague’s desk or go to the kitchen and make yourself a cup of tea. Unless your office is located on the 50th floor, you should treat elevators and escalators as your enemy. Walking to your cubicle is an excellent way to stay fit. If your workplace is near your residence, then ditch your car and walk. You can always wake up early so that you have enough time to walk to your office. If your residence is too far away and you’re forced to take your car, consider parking far away from the office so you that you can walk the rest of the way. Restaurant food is filled with excess sugar and salt, which means it’s not going to be as healthy as your home-cooked meals. You can spare some time in the evening or during the weekend to prepare packed lunches for your entire week. Push your hips as far back as possible. Ideally, there should be a gap between the back of your knees and the set. Set the height of your office chair to your preferred position. The seat’s height should be adjusted to allow both of your feet to rest flat on the floor. Plus, your knees and hips should be at the same height. If you are a bit short, use the chair’s footrest to elevate your feet. Recline the backrest so that it leans back slightly- to about 100 degrees. The armrests should also be adjusted so that when you rest your elbows, your shoulders are down and in a relaxed position. If you work a 9 to 5 job, then you understand just how important a good ergonomic office chair is. The human spine is not designed to tolerate hours of sitting at a desk. This is why it’s important to choose a quality office chair that can cradle you as you work while giving you ultimate comfort and a good posture. That said, you shouldn’t have to spend a fortune getting the right office chair. In our review, we’ve rounded up the best office chairs under $300. These chairs have identical features to and they work just as well as the high-end counterparts.